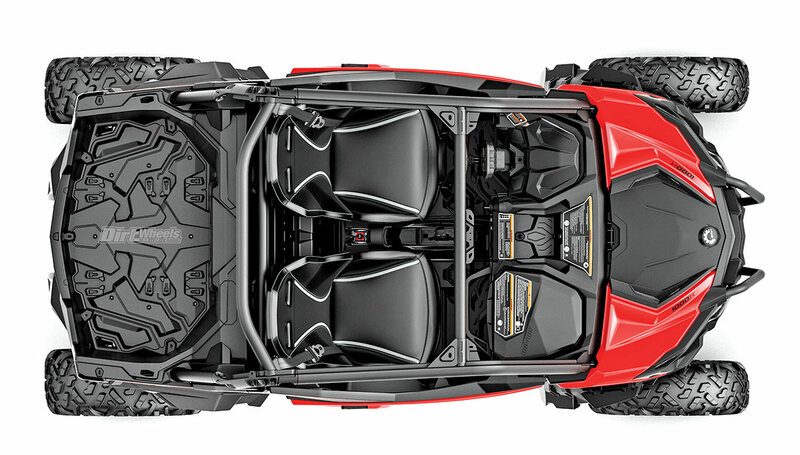 Breaking traction in the Maverick Sport 1000R is made easy by a 100-horsepower engine output. A quick tap of the brake pedal sets the slide in motion. As you actuate the throttle, the crisp awakening of the Can-Am Maverick Sport’s 1000R V-twin engine has a throaty tone that fills the cab. The UTV begins its lean, while the outside Fox Podium shocks settle into their compression stroke, as the inside wheels lighten. A hefty roost of tacky dirt and rocks sprays the trail and trees on the outside of the corner. You counter-steer your power slide just right through the apex of the turn and bury your foot in the throttle on the way out, allowing the engine torque to pull you back into the seat. This is the sort of maneuver you’d avoid in Can-Am’s 50-inch-wide Maverick Trail. Fifty-inch cars are for tight, narrow trails. The new 2019 Maverick Sport is a wider woods weapon! It gained 10 inches of width over the Trail, along with other welcome features. And that 10 inches makes it a more stable and planted car on fast trails or roads. Even more recently released are 64-inch-wide versions and a four-seat model that we have yet to get our greedy paws on. Let’s get down to it. The major improvement to this machine is its wider stance and improved, longer-travel suspension setup. The 2018 and 2019 Maverick Trail and the 2019 Maverick Sport share the same frame, engine and transmission package and even the same body to a large extent. The trail fits easily in tight spaces, and the reasonably long 90.6-inch wheelbase grants the machine a nice ride at slower speeds. But, let’s face it, all 50-inch cars have limits that don’t like to be pushed. Riders who want to go fast in tight terrain and don’t have 50-inch trail restrictions to follow, the Maverick Sport is built for you. The Sport’s cockpit is comfortable, and the steering wheel is tilt-adjustable. The dash has a 5.3-gallon storage container built in. The Sport is 60 inches wide. 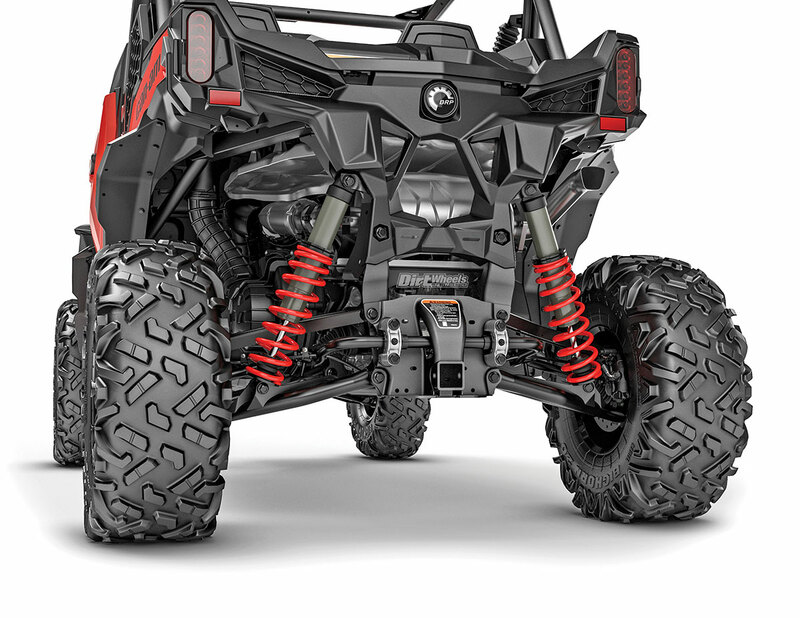 Can-Am created the added width by bolting up longer A-arms, longer brake lines, longer axles and more up front, with similar actions in the rear. The Maverick Trail boasts 10 inches of front travel and 10.5 in the rear. The all-new Sport features 11.5 inches up front with 12 inches from the rear Torsional Trailing Arm suspension. The smoother and more stable ride is complemented by sway bars at both ends. Can-Am, like many other manufacturers, employs Fox shocks on performance machines. The Sport uses Podium 2.0 shocks that are preload adjustable. 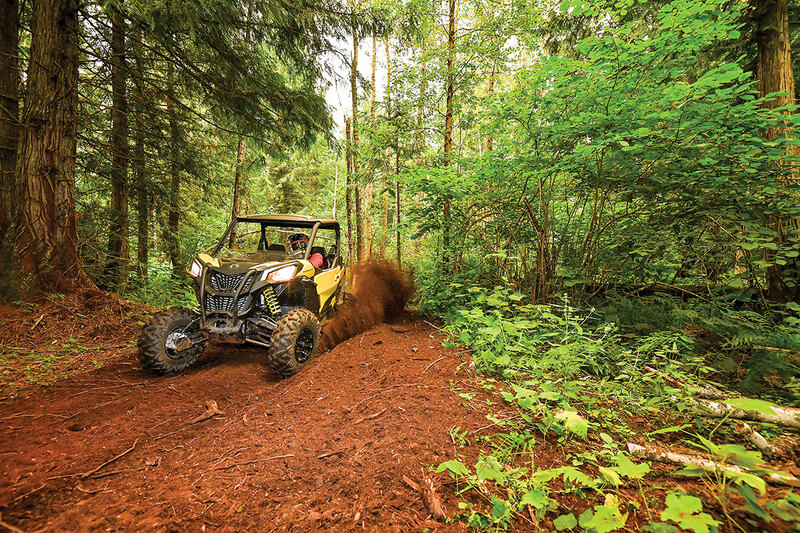 Turning assistance is provided by Can-Am’s Tri-Mode Dynamic Power Steering. You get to choose from three levels, so you can select less or more feedback from the steering. 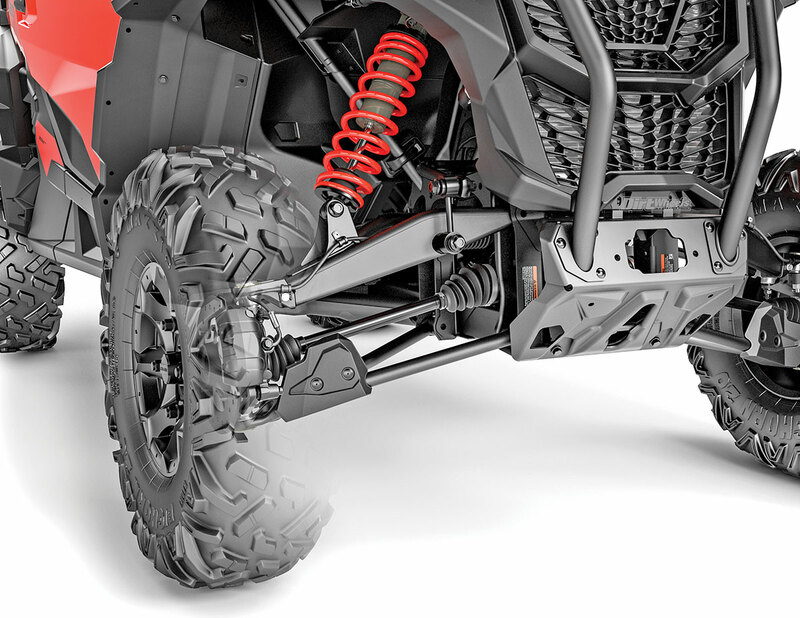 Can-Am employs their Torsional Trailing Arm technology for the independent rear suspension. Fox Podium shocks are standard on the Sport. 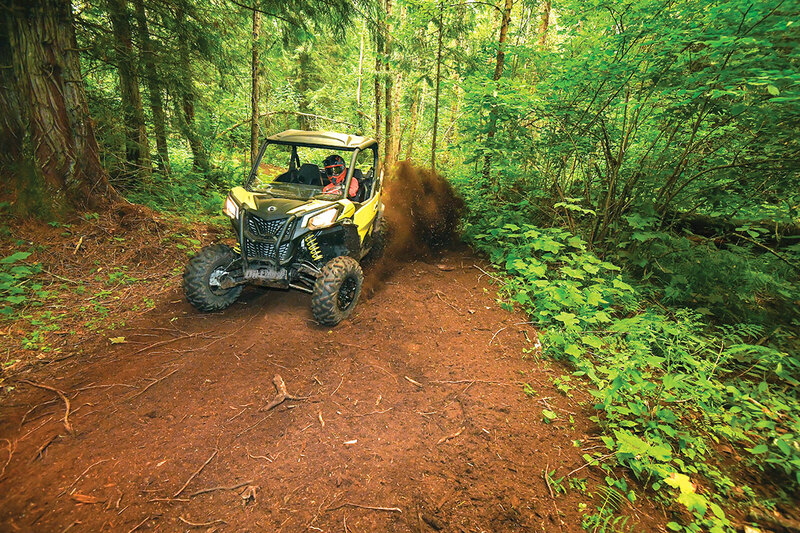 The Maverick Trail has engine flavors to choose from, and the Sport shares a similar choice. Can-Am delivers the Sport model with a Rotax 1000 or 1000R powerplant. Both have a 976cc V-twin four-stroke that is liquid-cooled and electronically fuel-injected. The difference between the engines is a 75- or 100-horsepower rating. Both versions of the powerplant on the EPS models have engine braking and are connected to an automatic CV-style transmission. The CVT gearing is manipulated through a gated shifter with high, low, neutral, reverse and park. Wheels are then provided power, and in 4WD a Visco-Lok QE auto-locking front differential helps motivate the Maverick. The 1000R EPS gets the 25-horsepower increase, and that is the model that we got to spend time and miles in for this test. 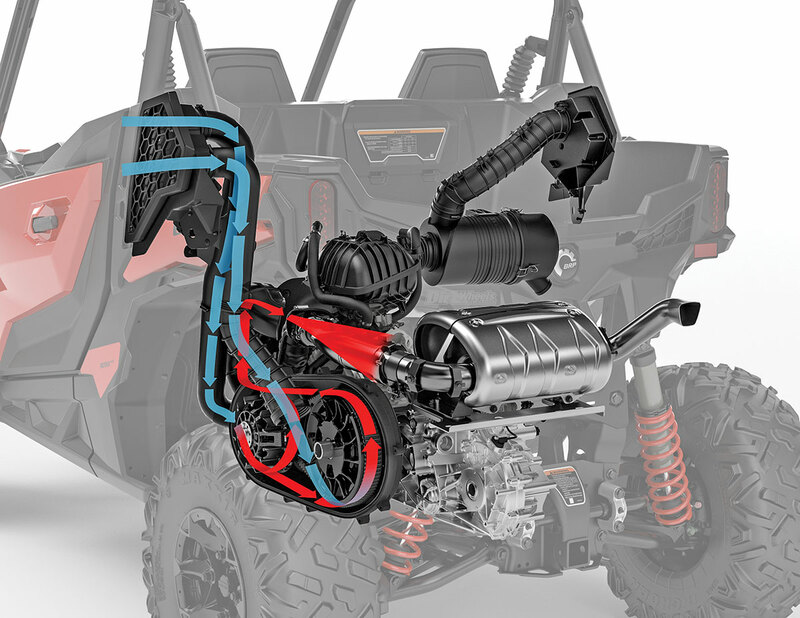 In order to pull more power out of the 1000R, Can-Am added a second CVT intake vent and a new driven pulley that is derived from the Maverick X3. There is more trickery involved, but those are contributing factors. 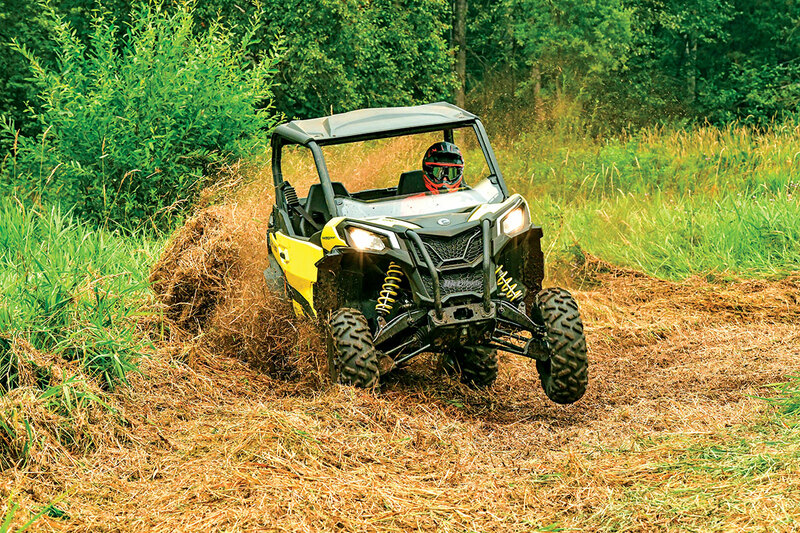 The Sport utilizes Can-Am’s iTC, or Intelligent Throttle Control, that allows the use of different power modes. Eco and Sport are the options, and you can tell a vast difference in output. The base Sport model comes without the modes or EPS. The 60-inch-wide track allows you to get the Sport sideways with ease and confidence. 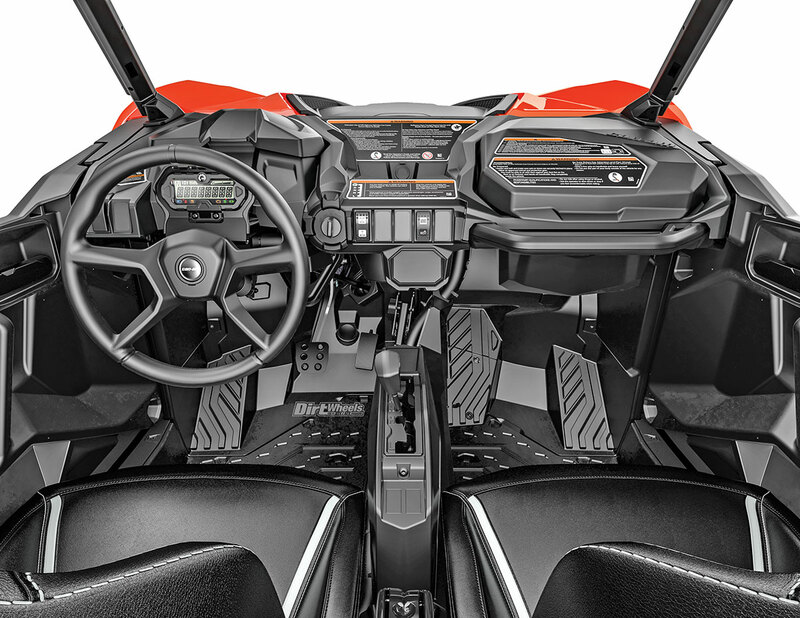 We spent many hours and miles in Can-Am’s 2018 Maverick Trail during testing, and one of the biggest complaints in the cockpit was elbowroom. Quality half doors come standard on these machines, but they had little arch to them. Can-Am fixed that by adding 2.5 inches of elbowroom during a redesign of the doors. The cockpit is designed to have the driver and passenger nestled comfortably and safely inside. The driver seat has 5 inches of forward adjustment. The steering wheel has 25 degrees of tilt adjustability as well. There are two angled footrests on the passenger side and ergonomically placed hand-holds. The seats are sports-car-inspired, and the seat backs and bottom cushions are removable to ease cleaning duties. The seats and cage are ready to accept four-point-harness seatbelt systems. The Maverick Sport is capable of handling some hard work. A rear 2-inch hitch receiver provides the ability to tow up to 1500 pounds. The cargo bed has a 300-pound capacity, with four anchor hooks and drain holes. In the dash of the Maverick is 5.3 gallons of storage capacity. The fuel tank is 10 gallons in size, so you can stay out on the trails for hours. The front suspension sports 11.5 inches of wheel travel and has a sway bar to assist with stability. After casually lowering into the driver seat and firing up the Rotax 1000R engine, it was time to tackle some tight woods trails in a lush Canadian forest. Power is potent in the Maverick Sport, yet it is manageable. The CVT engages quickly and in a smooth fashion. Typical of Rotax V-twins, the power range of the engine is meaty at smaller throttle openings, and it keeps pulling with a welcome strength as you push harder on the pedal. The rumble and growl of a V-twin are somehow satisfying and different from parallel twins of the same displacement. The Can-Am’s engine braking kicks in on deceleration. Fortunately, it isn’t too strong, so you can enjoy a sporty feel. In Eco mode, power output is cut down heavily, which prolongs fuel life and allows for smoother operation in slow and rough terrain. On the 1000R model, Can-Am included a second CVT air intake to help with cooling. This variant produces 100 horsepower. Front and rear twin-piston-caliper hydraulic disc brakes the retard excess momentum. Brake-pedal effort is slightly on the stiff side, so the feel isn’t as natural as we would have liked. The brakes do stop the Sport very quickly, though. Maxxis 27-inch Bighorn tires assist in slowing down or speeding up the Sport. They also help give the machine 12 inches of ground clearance. The Maverick Sport surprised us with how well it handled. The 60-inch-wide machine rounded corners with ease and stability. The EPS helped saw the steering wheel around, and we mainly ran it on the high mode. When the going got rough, the shocks soaked up the hits well. We would like to try out shocks that are more adjustable and have greater bottoming resistance in the future. In comparison to the Trail, the Sport is smoother and more capable at higher speeds. The Maverick has a 90.6-inch wheelbase with a 60-inch width. The cargo bed can hold up to 300 pounds. 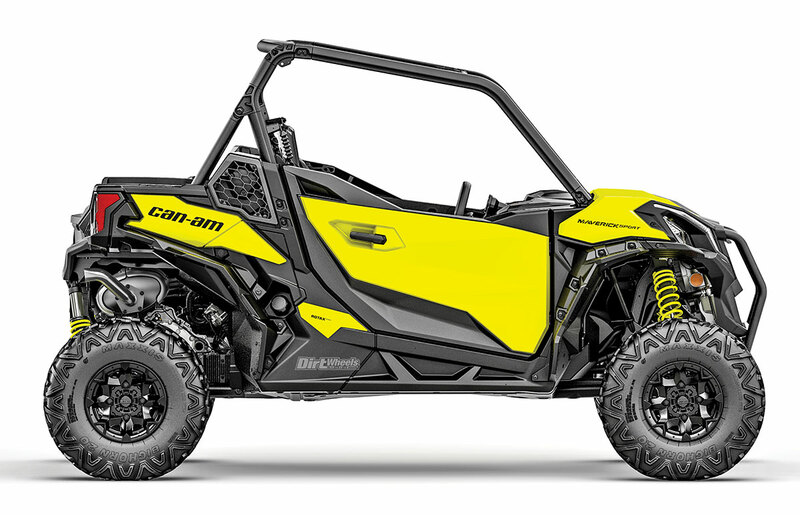 We have a lot of praise for Can-Am’s new Maverick Sport. It feels solidly built, tackles tight and wide-open trails with composure and comfort, and has a potent powerplant. Eventually, we will get our hands on the even wider Sport X rc model and see how it fares in wide-open terrain and rocks, but for now we will happily pilot the Sport 1000R DPS in all terrains. You can get the base Sport with the 75-horse 1000 engine. If you upgrade to the Sport DPS, you can choose the 1000 or 1000R version. 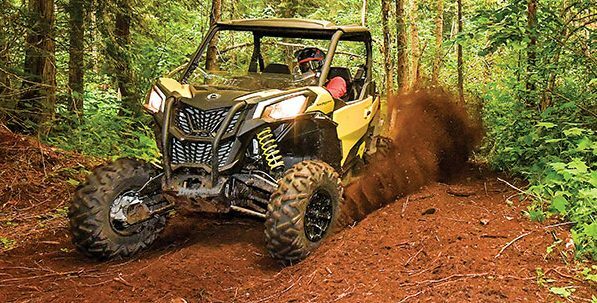 Now, Can-Am offers a Sport Max four-seater, the X mr mud machine and, as previously stated, the X rc rock crawler. Go to www.can-am.brp.com or call (715) 848-4957 for more info on this machine, or the rest of their extensive and impressive lineup! Can-Am widened the space in the cockpit by 5 inches. They performed this by altering the door design to provide extra elbowroom. Cargo bed capacity 300 lb.